Moorfields Hospital is a specialist NHS facility for ocular health, located near Old Street, north of the City of London. In 2003 Penoyre & Prasad were appointed to be the architects of the Richard Desmond Children’s Eye Centre at Moorfields Hospital. 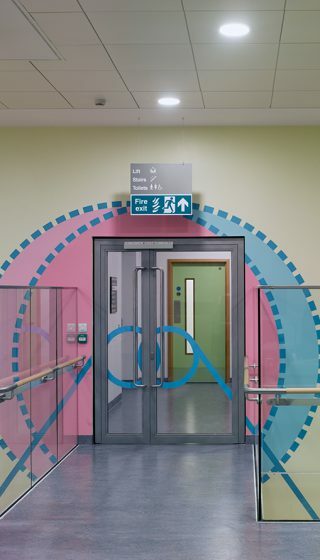 It was proposed by the architects in the winning scheme, that there should be significant art content inherent within the design of the new building given the hospital is the only facility devoted to children’s eye conditions. They liked the idea that human vision would be central to the therapeutic value of the new health facility. Art Office brought Jennifer Mojica on board as part of the design team to oversee the public art commissions. To begin with the budget was set to twice the amount that was raised by the hospital, which resulted in fewer commissions. The final budget of 90,000 GBP allowed for just four projects. After an initial selection process the two larger ones were awarded to Alison Turnbull and Yuko Shiraishi. Samantha Bryan and Lucy Casson were also awarded commissions. Though due to the budget constraints these were smaller and aimed squarely at the young patients that would be being treated at the new facility. The south facing wall of the new building had a large area of glazing that the architects realized needed a louvre system to moderate the associated heat and light coming into the building at that point. Alison Turnbull is a painter that works with grids and systems and applies them to all manner of subject matter she picks up from visual sources like maps and diagrams, so she felt this was the most appropriate site for what she could bring to the project. Her starting point was a drawing or chart called the Amsler Grid used by Ophthalmologists to assess the eye condition macular degeneration. The condition varies in intensity, as the patient’s vision is lost so they see distortions of the grid structure. She viewed the louvres as a huge grid that was being distorted horizontally, the surfaces were treated in three shades of silver grey to create a subtle shift in surface appearance as they were moved to restrict or open up to light entering the building. At night the building took on a more colourful appearance. The louvres were lit using coloured led lights, which along with an orange box that was not part of the original scheme, broke with the concept of the commission. Alison Turnbull was philosophical about how the commission was used by the architects to decorate the building, putting the changes they made down to the limitations of working ‘collaboratively’ for an artist. 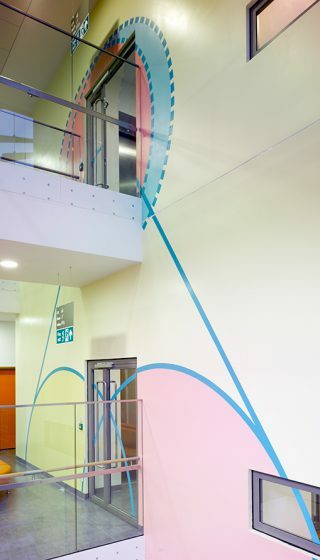 The second commission of a large wall painting was proposed to Penoyre & Prasad by Yuko Shiraishi. It extended over the five floors of a prominent stairwell that led from the ground floor entrance to the main waiting areas on each floor. A painter who works extensively with colour, Shiraishi developed her proposal based upon the threadlike structures of axons that connect retinal ganglion cells found in the inner retina. They transmit information from the retina to the brain. It is a process that is fundamental to our sense of perception. These structures are only made visible microscopically so she used them to connect the different levels of the building in an abstracted way. 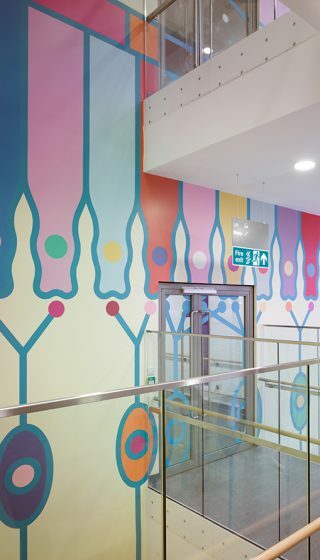 The commission was supported with one of the architects, who worked on the original plans of the building to create the layout for the wall painting, which was executed by six artists over twenty days. The end result was a successful outcome for the artist, the architects and the users of the building.